The resulting WIM/ISO image does not contain drivers specified in Step 1. Create a WIM image with Acronis Backup & Recovery 10, and manually add drivers to it as described in Microsoft TechNet Article: Add Device Drivers to an Offline Windows Image. Then create an ISO image from WIM image as described in Microsoft TechNet Article: Walkthrough: Create a Custom Windows PE Image. You can try to add drivers to a running WinPE image using drvload.exe. See this Microsoft TechNet article. Use Windows PE 2.0/2.1 instead of Windows PE 3.0. Acronis Backup & Recovery 10 correctly works with these versions of Windows PE, and will add drivers to WIM/ISO image automatically. 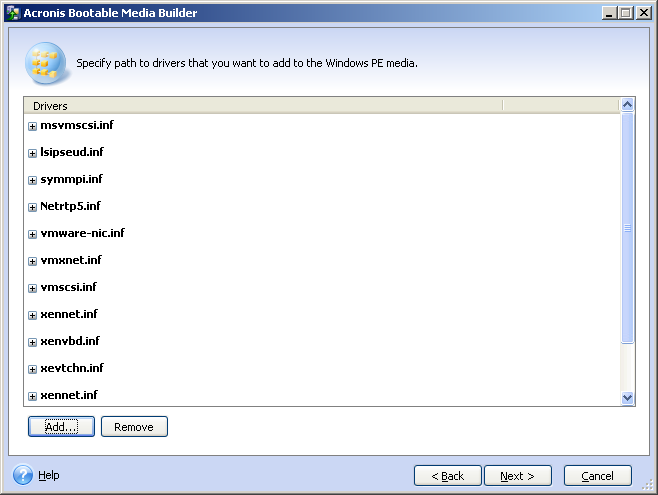 See also Acronis Backup & Recovery 10: Using Acronis Media Builder to Build WinPE with Acronis Plug-In.